Mutts were like Rodney Dangerfield. They got no respect. That’s changing now. National Mutt Day is celebrated on July 31 and December 2. The main focus is to foster awareness of the many mixed-breed dogs available for rescue or adoption. Mutts deserve respect and recognition for their uniqueness on a special day and every day of the year. The Westminster Kennel Club added an agility competition to its dog show and opened it to mixed breeds, but they are still prohibited from competing for Best in Show. A dog named Roo! made history by becoming the 24 inch agility champion in the Masters Agility Championship. Panda placed fourth in the 20 inch division. Other mutts did their stuff and made their owners proud. The Westminster Kennel Club elects to refer to mixed breeds as “All American” dogs. I wonder how the Scottish terriers, Chinese Shar-Pei, Irish setters and others feel about that. Personally, in my book the affectionate term “Mutt” will never be replaced. Today’s dogs have a lot of goodies that the Beeson mutts didn’t have. Some dog owners get out boots, hats, and turtlenecks to keep their friends warm in cold climates. 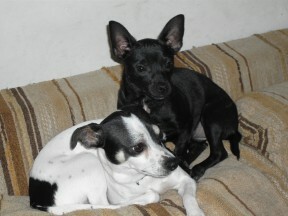 My mutts stayed outdoors in the cold Pennsylvania winters and in the sizzling summers. McDuff and Dawn lived inside with me. Danger lurked outside for Dawn and as hard as I tried, I couldn’t protect her from it. Dawn was allergic to fleas. Allergic to fleas! The Beeson mutts’ BFFs were fleas. McDuff slept in the bed with me, his back up against my leg. My Beeson mutts never saw the inside of the bedroom. 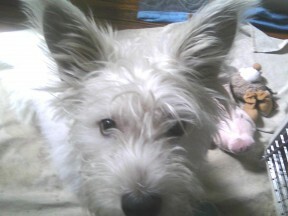 McDuff and Dawn got Kibbles & Bits and doggie treats. My mutts got table scraps and thrived on any kind of bone they could get. No doggie dental appointments were scheduled. When the coal miners went out on strike, they were lucky to get bread soaked with bacon grease. Dogs in Beeson had stomachs and digestive systems made of cast iron. When I think of the things the poor Beeson dogs missed out on, I pity them. No pet hotels, TV programs, pet therapists, veterinarians, facials, massages, designer clothes, seat belts and restraints, sitters, puzzles, acupuncture, and doggie parks. They didn’t go to pet spas and groomers with shampoos, blow dryers and perfume. We made an appointment at the nearest creek and tossed them in when they got too stinky. Now I admit that I indulged McDuff and Dawn in some of the activities mentioned. A lot of dog lovers do that nowadays. Have you ever seen the look of pure ecstasy on the face of a dog with his head protruding out of the back window of a car? Teeth exposed and jaws flapping in the breeze. The reason for their extreme delight is the mouthwatering scents floating in the air. According to experts, a dog’s brain is one-tenth the size of ours, but a dog’s sense of smell is about 1,000 to 10,000,000 times more sensitive. For example, Bloodhounds are referred to as a nose with a dog attached. They can track a cold trail twelve days old over a wide range. And even over water. So do you see why dogs get such a kick out of riding in a car with their heads hanging out of the window? They are feasting on a smorgasbord of delectable and intoxicating smells. That’s the only way a dog traveled in a car during my childhood and most of my adult life. Simply because dog car restraints and seat belts didn’t exist for them then. Now many states legislate that they be used. But despite the hazards of an unrestrained dog in the back seat, lots of folks don’t have the heart to deny their buddies the unbridled joy they so obviously experience. Mutts are not going away. They comprise 53% of all dogs in America. I’m glad there is a National Mutt Day twice a year and that the Westminster Kennel Club Dog Show is welcoming mutts to participate in the newly created agility competition. And I’m ecstatic that mutts are finally getting the respect and recognition they deserve. If you are owned by a mutt, feel free to share in the comments! Find more pet articles of all kinds in our pets section. Check out KRL’s review of Life with McDuff: Lessons Learned from a Therapy Dog by Judy McFadden. And you can find more pet related articles and stories in our Pets section. Judy McFadden, author of Life with McDuff: Lessons Learned from a Therapy Dog, lives in Reynoldsburg, Ohio, and speaks to audiences about the benefits of animal assisted therapy and reading programs like Therapy Dogs International and Reading with Rover. Please see http://www.lifewithmcduff.com. Mutts make the best pets and are healthier…and don’t forget some of us believe dog is God spelled backward! I started out wanting to adopt an Australian Shepherd because they are so smart and really good dogs. Although I had loved the two little dogs fiercely, Hubby wanted a more substantial dog. Well, a little more than 4 months ago I adopted the perfect dog, but it wasn’t the Aussie I went to the adoption event to see. Dylan the Dog is a mixed Spaniel and Golden Retriever and is the love of my life. He is just the right size at 35 pounds with a face that can melt anyone’s heart. He loves to cuddle with his head in your lap like a baby, has his own little language, ow-oo-oo, and grabbed my heart from the first moment I saw him. He has the best traits of both breeds. A real winner! 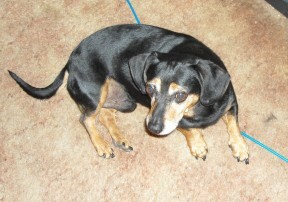 I almost fell out of my chair when I saw the photo of “Sawyer, a Dachshund mix.” He’s the exact image of my one and only childhood mutt, Lucky. As an only child Lucky was my loyal confidant, constant companion and fierce protector. He may have been small but was quite the scrapper and I never feared anything with him at my side. And would you believe I had the first dream in probably 40 years about him just last night! Another reason I’m in shock to see that photo. Wonderful article, Judy! Here’s to the mutts! Thanks, Judy, for your inspired and informative article. My wife and I adore our mixed breed. Thank you, Judy, for giving our beloved mutts equal time. I’ve lived with an Afghan Hound and a Golden Retriever, both sweet, beautiful companions. But my little Benji, terrier mix, was the love of my life. LOVE this article! Yes to mutts – four live in our house! I’ll have dogs all my life, and as far as I’m concerned, they can all be mutts! They’re loving, and when rescued, so grateful. If people would be open to adopting rescued animals, and mutts, it would help put an end to puppy mills and backyard breeders. I only had mutts growing up. I lived in the city, so they were always street smart. My favorite mutt was Poochie. She would always misbehaved, but I didn’t mind so did I. Thanks for the memories. Great article Judy! What a great article, Judy! The dog of my childhood, Randy, had a similar life to the dogs of your childhood. He was well loved but treated well, like a dog. My father used to hose him off when he got stinky. Flash forward 30 years, we rescued our first mutt, a German Shepherd mystery mix, 11 years ago and he has been the most loving friend and companion. He is also the overseer of the house, he is always on watchdog patrol. Our second dog is a GS/Pit/Anyone’s guess mix, and she is the most comical joyful little dog I’ve ever seen. Both of them are allergic, I cook their food for them and they are treated more like children than dogs. Thank you for writing an article about what great dogs mutts are. Since we are now, proudly, a nation of mutts, perhaps there should be a movement to have the mutt declared the national dog. Thanks, Judy. I always enjoy the enthusiasm and fun you put into your writing. I grew up in Mt. Charleston, Nevada living in a family-built cabin. I always adored animals and had a great curiosity for the variety of wildlife this beautiful location had to offer; however, I was a terribly lonely, little girl and begged my parents for a dog. I remember the day we went into town to one of the local animal shelters and selected a doe-eyed, mutt. He was blonde and somewhat resembled a Golden Retriever. My mother always named all of the family pets and named my new friend, “Ringo.” I always assumed that she had a fascination with Ringo Starr but all I knew was that “Ringo” was, definitely, a “star” in my eyes. I cannot possibly convey the joy and companionship he brought to my life. I had a devoted buddy to roam with who enjoyed equally, the discovery of the vast outdoors. These memories are still very precious to me even though this idyllic time took place close to fifty years ago. What does a pedigree have that a mutt doesn’t have…simply, the “pedigree!” A mutt provides just as much love, devotion and companionship. Anyone thinking of a new pet might check-out his/her local animal shelter or adoption center. I have found that many provide a history to include the animal’s adaptability, family history and compatibility with children and/or other household pets. Want to be an instant “hero,” adopt a mutt. You will most certainly will be a “hero” to your new-found friend and companion! Judy, your articles always make me think just a little bit deeper and a little more compassionately about our wonderful world of animals! Love the photo of Ozzie and the others. I have had a few mutts and they make awesome pets. What a great article Judy. God bless the mutts! A co-worker shared your article with me because she knows what an animal lover I am. I rescued my current mutt as well as most of my other animals and they have brough love and joy to my life! What do you know, I must be destined to own mutss as National Mutt day is on my birthday. Thank you, doggy mom Judy for championing my class of canines. Our loving household humans have known and shown how much we mixed breeds deserve TLC regardless of our parentage. In the land of Muttdom, we relish being more Downtown than Downton.